Elections always tend to influence financial markets in either a positive or negative way, mainly depending on the general perception as to whether the incumbent in the White House is going to be a change for good, or not as the case may be. There are some interesting historical precedents when it comes to stock market reactions immediately after a presidential election, which in turn, has a definite influence on other financial instruments and markets, such as the price of gold. You might be surprised to discover that every US election staged since 1888, has resulted in average stock market decline of about 0.5% in the first three days of the first new presidential week. The longer term outlook if you are looking at statistics, is that stocks have historically fared better over the full four-year term, when a Democratic administration has taken up residence in the White House. The trouble with historical statistics and precedents, is that there may well be a point where markets don’t react in the way you expect them to, next time around. That could certainly be the case when you have two front-runner candidates for the White House, who polarize opinion. If Mr Trump swept to power, all previous bets could be off. So the question is, if there is uncertainty or optimism when the U.S election result is known, what will be the impact on the price of gold? 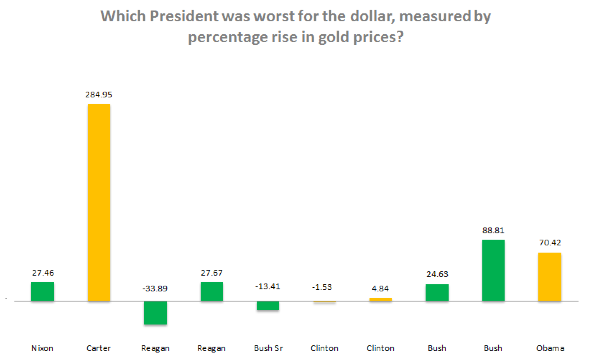 This graph (courtesy of The Real Asset Co) asked the question, which President was worst for the dollar, measured by percentage rise in gold prices? You can see that Obama had a positive influence on the price of gold, especially when he was granted a second term. In fact, the history is that Democratic presidents send gold prices up and the dollar down, although if you want an even more positive buy signal, 2nd term Presidents in general, tend to send gold prices higher and push the dollar down lower. There is no question that election cycles do have an impact on where the price of gold is headed. The price can often be considered as a response to a situation such as when the economy is seen as artificially strong, in an attempt to influence the intentions of the voting electorate. Whether you take a cynical view or not about the idea that the economy is sometimes stimulated for the purpose of trying to sway an election, there is no question when you look at past results, that when the economic news is favorable, the price of the dollar will often rise and gold prices will stand still or maybe even fall slightly. If you are a believer in history repeating itself, you can find plenty of examples of election year price volatility for gold. If you take the last three elections in 2004, 2008 and 2012 for example, the 12-month period leading up to each election have all resulted in a drop in gold prices just prior to the election. Gold has traditionally been regarded as a safe haven in challenging economic times and therefore if there is a positive outlook just prior to an election, it is a predictable consequence that the gold price would come under pressure. Political maneuvering can be responsible for gold price volatility, just as much as economic conditions influenced by other factors. Gold prices are no different to stock market indexes, in as much as they are both sensitive to political and economic indicators and events. When the national debt figure is considered to be high enough for concern, when inflation is running high, or when unemployment figures make uncomfortable reading, these are just some of the factors that could push gold prices up. Some speculators even go as far as to consider gold pricing to be strongly linked to the fortunes of a political party, and there is some statistical evidence to support this line of thinking. Taking everything into consideration, the bottom line would appear to be that whoever wins the keys to the White House, the price of gold is likely to go up. By how much, would probably be dependent on a number of crucial factors, such as who gets in and how markets react to their appointment. History shows us that the price of gold will often rise in the days following a US election, by how much, will mainly depend on who wins the vote to govern. This really isn’t your father’s investment market anymore. Not even close, as alternative investors veer off the well-worn path to pour billions into hazy hallucinogenics, otherwise know as the legal marijuana market. By and large, the U.S. cannabis market is defined as “markets composed of individuals who legally consume marijuana as allowed by state laws, together with the businesses that constitute the supply chain to serve those consumers,” according to ArcView Group, an investors network firm located in San Francisco. ArcView releases a regular report on the U.S. legal marijuana market, entitled “State of Legal Marijuana Markets”. In its most recent version (the fourth in the series), ArcView details the burgeoning, yet potentially explosive growth of the nationwide cannabis market, a trend that deserves to be on the radar screen of all alternative market investors. 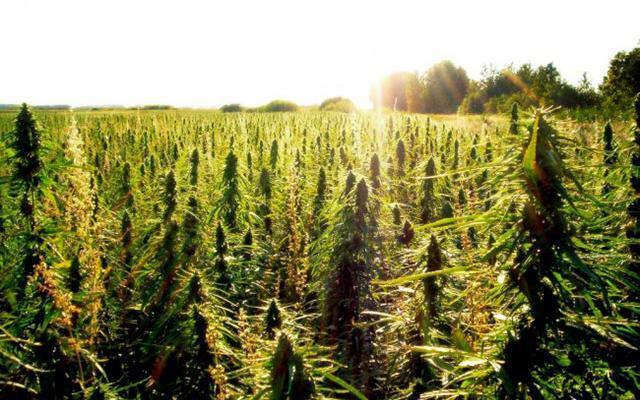 2015 was another watershed year for the legal cannabis market. National legal sales grew to $5.4 billion up from $4.6 billion in 2014, fueled by explosive growth in adult use market sales, which grew from $351 million in 2014 to $998 million, an increase of 184%. Demand is expected to remain strong in 2016 with legal markets projected to grow to $6.7 billion, a 24% increase over 2015. By 2020, legal market sales will grow to $21.8 billion, with adult use sales comprising nearly two-thirds of the total market. If all U.S. states were to okay legal pot usage, certainly an uphill climb, even as marijuana laws grow more amenable at a skyrocketing pace, growth would be accelerated. According to ArcView, the nationwide cannabis market would be valued at over $36 billion, if the herbal drug were legal across the country. Some Wall Street veterans are already climbing aboard the cannabis bandwagon. Two experienced Wall Street hands are rolling out Amercanex Corp., an electronic cannabis-trading platform that handles sales of about 100 to 150 pounds of weed a week. Richard Schaeffer, former chairman of the New York Mercantile Exchange, and by Steve Janic, a long-time Wall Street veteran, are at the helm, and business is already brisk. According to industry figures, Amercanex’s 20,000 seats are going for $20,000 apiece, up from $2,500 when the exchange opened. The exchange currently has 20,000 seats, which originally sold for $2,500 apiece, but now go for $10,000. Additionally, in early 2016, Sohum Shah, a 26-year-old University of Arizona college graduate, saw his fledgling Cannabis Commodities Exchange hit the investment market pipeline. While that trading platform operates only in one U.S. state (Colorado one of two U.S. states along with Washington where general marijuana sales are legal), Shah sees it expanding into other U.S. regions. 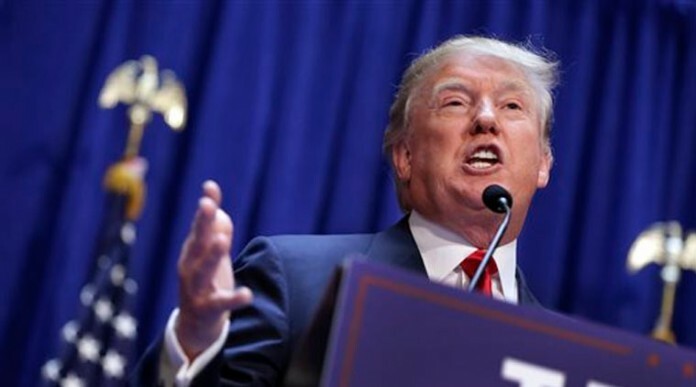 Recent Performance Tepid – But Upside In ’16? 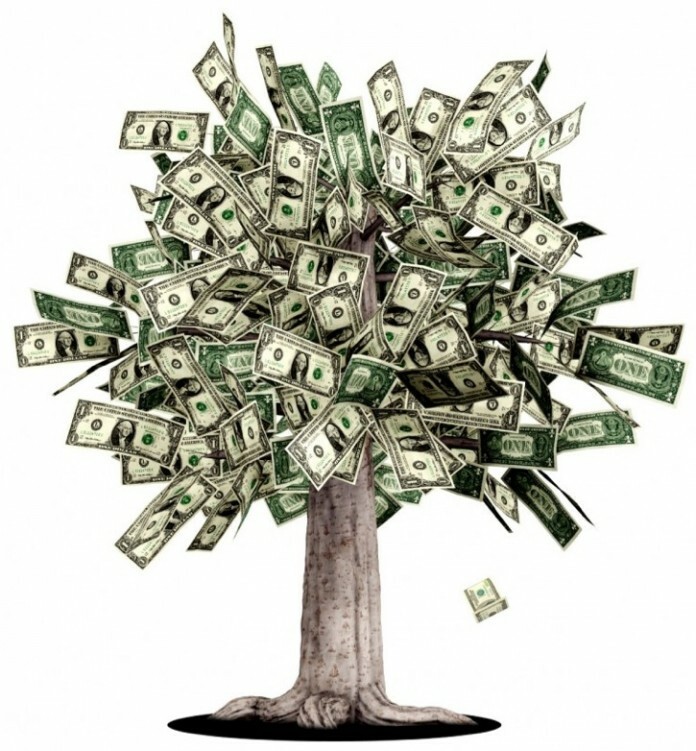 Of course, with any potential alternative investment, caveats abound, and marijuana stocks, funds, and other vehicles took their lumps in 2015. According to New Frontier’s Marijuana Stock Index, cannabis stocks lost half their value, as measured in the exchange. Weighed against conventional stocks, pot stocks performed significantly more poorly, down 44% against both the NASDAQ and Standard & Poor’s 500. But 2016 has proven to be a different story. As of March 21, 2016, Mentor Capital’s Mentor’s Cannabis Index for Value Investors has gained 22% so far this year 2016. Analysts credit the U.S. Federal Drug Administration’s recent green-light on GW Pharmaceuticals’ (NASDAQ:GWPH) cannabidiol drug for childhood epilepsy, although indoor cultivation system experts Surna, Inc., (OTCQB:SRNA) has seen huge share price growth and rising sales, too, according to Mentor Capital. But there is another issue in play, and it’s a political one. Mentor says the political environment is one that favors both pot users and marijuana as a valid and profitable investment vehicle. “Because legal marijuana sales growth is largely a political reclassification from illegal to legal it is not surprising that there is great interest in the political changes this election cycle will bring within the cannabis operating and investment community,” says Mentor CEO, Chet Billingsley. “Speculations abound from Donald Trump co-opting the youth vote and weeks of air time by backing legalization once he is past the primaries, to President Obama declassifying marijuana off of Schedule 1 as a swansong during his last days. Regardless, the political mode is for greater legalization. That momentum seems to support the observed growth in the legal cannabis market, and the index, at about 400% of the growth of NASDAQ,” Billingsley adds. Legalizing marijuana has some addition ancillary impact that can help fuel cannabis’ growth – mainly, by taking pot out of the black market and propping it in financial markets. Cannabis can be a “good investment opportunity”, as long as marijuana stocks and funds are mixed into a diverse investment portfolio, and is earmarked for “no more than 10% of the entire portfolio”, explains Jim Fitzpatrick, a board member at Kodiak Capital Group, LLC in Newport Beach, Ca. As an alternative investment vehicle, marijuana is just getting started, and that incubation period is worth noting. Plus, opportunities to invest in cannabis-related funds and ETFs are scant, although expect some to sprout up as marijuana continues to be legalized in more U.S. states. Past all that, the key for long-term growth is clear – have enough states legalize the drug and force federal legalization soon after, which would bust the pot market wide open. Some analysts think that could happen sooner than you think. A new study by Ackrell Capital predicts Uncle Sam will legalize cannabis by 2020, thus ushering in a huge new era of growth where the domestic marijuana market would be valued at $100 billion by 2029. “We believe that it is a question of when – not if – the federal prohibition on cannabis will end,” Ackrell noted in its study. Until then, do your research and proceed cautiously into what Ackrell calls the “Green Gold Rush.” No doubt, opportunity is abundant in the cannabis market, but it’s a market that’s going to need some seasoning first. In the past couple of years the term “Blockchain”, has been thrown around. As of late it’s becoming much more mainstream and something that’s of interest to both private investors and lay people alike. There’s been a lot financial professionals touting this as the next big invention, a paradigm shift similar to what the Internet did to the world. Let’s get down to what a blockchain actually is. Simply put it is a certain kind of digital database (or ledger) that is able to store transactions. But there is a multitude of ways it differs from the traditional type of ledger. From a financial standpoint what it does is stores transactions in the form of a digital block, each subsequent and preceding block references the prior one. Each block that represents a transaction is only added to the entire chain if it’s been verified through cryptographic algorithms done through using a significant amount of computing power. This verification process is integral to the uniqueness of the system and crucial in eliminating any possibility of fraud. Basically, it means that a block cannot be altered. Here’s why this is important. This entire database is distributed which means that all users know when there has been additions to the blockchain. 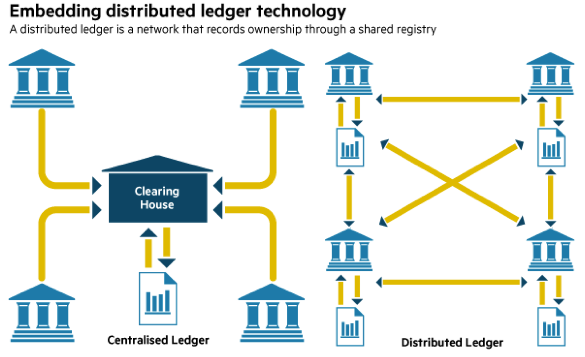 The public distribution of the ledger makes it both transparent and decentralized. A real world example of the blockchain technology at work is bitcoin. In the most pure form the blockchain records bitcoins that have been owned and each individual transaction of the cryptocurrency through a vast range of computers, as opposed to it being centrally located in one ledger. This technology has caught the attention of many large banks. A great selling point for the blockchain is that it does away with the middleman in a transaction. It makes transactions faster and less expensive compared to the current systems being used. Banks Like Goldman Sachs want to adopt this system to use with regular currency as opposed to just bitcoin. The blockchain can be instrumental in issuing shares and tracking banking and payments across the board. There is even more potential beyond regular currency as a lot of analysts see the blockchain being utilized in other areas aside from finance. The blockchain has the potential to redefine a myriad of varying industries. There’s the possibility to be able to track voting systems, automobile registrations, and even securing academic records. At its core, blockchain is a chance to bypass a lot of the bureaucratic mess in multiple industries. There comes a point when more resources are dedicated to the process itself than the actual transaction. It goes back to cutting out the middleman and allowing for more transparency and efficiency. Not only are these big banks adopting the technology, they’re also investing in companies using the blockchain as the crux behind their business. For example, the New York based Digital Asset Holdings released a statement in February, 2016 that Goldman and IBM recently raised $60 million in their latest round of funding for the company. Digital Asset Holdings began in 2015; its purpose is to develop software that uses blockchain to trade established financial and digital assets. The purpose of their technology is to make the entire process quicker and cheaper. The company has already announced that it will be developing the technology for the Australian Securities Exchange (ASX). This is a great first step for the technology to gain even more mainstream recognition. Not to mention it is going show an even greater proof of concept for anyone out there wondering about the validity of the tech. Companies like these are going to be avenues for investors to get in on the action. There are a couple ways for private investors to get involved with investing in the blockchain. For those who of course have the capital and know how, angel investing and funding in startups will be the best way to get in on the ground floor. Investing in these startups built on blockchain technology have some risks, but with greater risk the reward grows. Cryptocurrency has become an accepted form of payment in the past couple of years and entered many mainstream businesses. The amount of investors and entrepreneurs interested in this area has grown at an incredible rate. There is without a doubt a potential Google or Apple in the midst that will lead the blockchain revolution. Another simple way to get invested is to just buy bitcoin. There are multiple reasons behind this. One is the fact that it can be seen as a sort of digital hedge, similar to gold and can have a potential high return on investment. It’s a new type of asset class that a lot of people are still getting used to so there is of course going to be periods of high volatility. There are multiple ways to acquire bitcoin now. For those looking for their own type of virtual bank, there is Coinbase and Circle to just name a few. 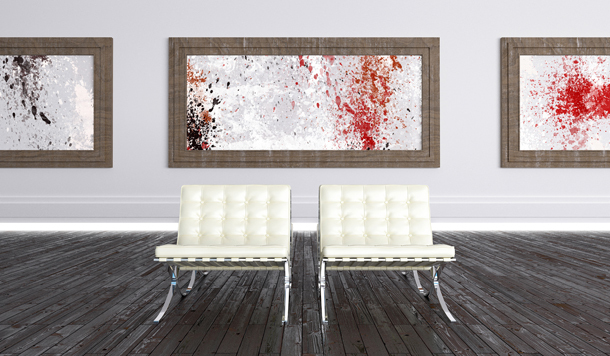 These act as both an exchange and a bank. There is also another option that allows the user to trade between other bitcoin owners. Local Bitcoins, is for individual traders and can allow for a slight variation of cost per bitcoin, there’s more of an inherent risk here, but another decently safe option. The best website to utilize for the price per coin is the blockchain info website. 3. Another roundabout way to get invested in blockchain technology is to just invest in the banks that are funding blockchain companies or utilizing it. Specifically there are some funds out there that shares can be bought in. An example of one of these funds is Bitcoin Investment Trust (GBTC), which holds bitcoins to track the price, similar to how the (GLD) gold trust works. Barry Silbert started the trust, a member of Digital Currency Group, a group that invested over seventy-five bitcoin and blockchain based startups. They just recently bought up the blockchain news website CoinDesk. Silbert said his main reason for starting the trust was so that a lot of casual investors could get into bitcoin without having to figure out where to buy it and store it. He considers it an easy play to get involved in the blockchain industry. The trust is up some 20% since it began trading in May of 2015..
Not only is there a great investing opportunity to be had, but there’s an opportunity to be able to utilize the blockchain through simplifying accounting and saving potential billions for various companies. Accounting and auditing are large costs throughout the world of business. Utilizing blockchain accounting would be effective in cutting a business’s costs. All internal transactions would be entered internally. With this the ability to be audited by outside regulators would be simple as the entire process of transactions is recorded and available for viewing. Once the fundamentals about blockchain are understood, then it’s time to go down the rabbit hole and learn how to utilize the technology and the potential implications behind it. There’s no better way than to read books written by the professionals on the matter. The first book of interest in Mastering Bitcoin by Andreas Antonopoulos. Antonopolous is a consultant to multiple bitcoin based start ups. He his a professor at the University of Nicosia, where he teaches courses on Digital Currencies. On the side he runs his own bitcoin podcast. His audience he’s targeting is for programmers out there. It helps aide them in the process of the actual code behind the working mechanisms of a cryptocurrency. As well as how to use them and develop software along the blockchain. For non-programmers, there’s a lot of knowledge not pertaining to code that explains the technologies in more depth. Another book of note is The Science of the Blockchain written by author Roger Wattenhofer. He’s a professor at ETH Zurich and formerly worked at Brown University and was involved with Microsoft Research. He’s a prolific writer who has published over 250 articles on the science of cryptocurrency. He goes through the route of explaining the systems through the scientific method, starting from the basics of building the systems. He also shows the different ways algorithms are created for the sole purpose of developing a blockchain. For those out there more inclined to the financial and economic aspects of bitcoin, Blockchain: Blueprint for a New Economy by Melanie Swan is a great book. Swan is the founder of the Institute for Blockchain Studies. Their sole purpose is to look at the implications inherent in spreading the decentralized technology. She decided to write the book when it became intuitive to her that blockchains were more than just a new way to utilize digital currencies but a new era akin to the advent of the computer and Internet age. Everything will be more secure as well as private, while being traceable at the same time. It sounds like a paradox but that is why blockchain is so important. Blockchain is ushering in the new age that will allow for large-scale global projects to be undertaken that just weren’t feasible under the current models that currently exist. It is an alluring investment that will pave the way for the future. Gold prices took a pummeling while stock markets rode the crest of a wave. But, based on the traditional view held by a number of investors, that the precious metal is best used as a hedge against inflation and when a safe-haven is required against falling prices, you would have expected gold to stage a rally when markets entered choppy waters. 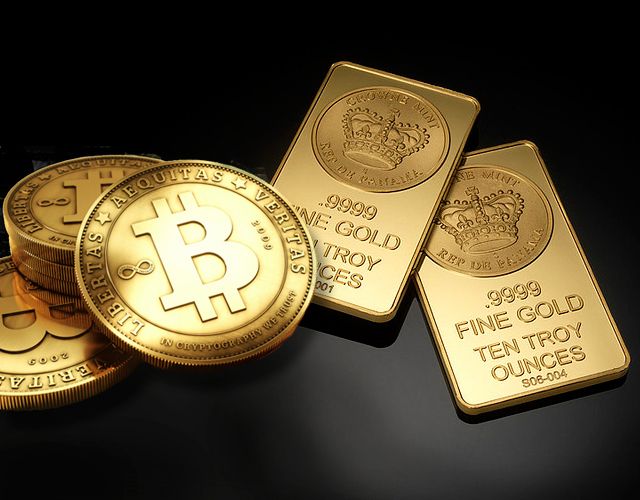 The fact that the gold price has failed to shine and recover its value as rapidly as it has done in the past, when faced with a similar economic scenario, has prompted some analysts and investors to ponder whether the role of gold has changed, in the face of competition from other investment options such as digital currencies like bitcoin. 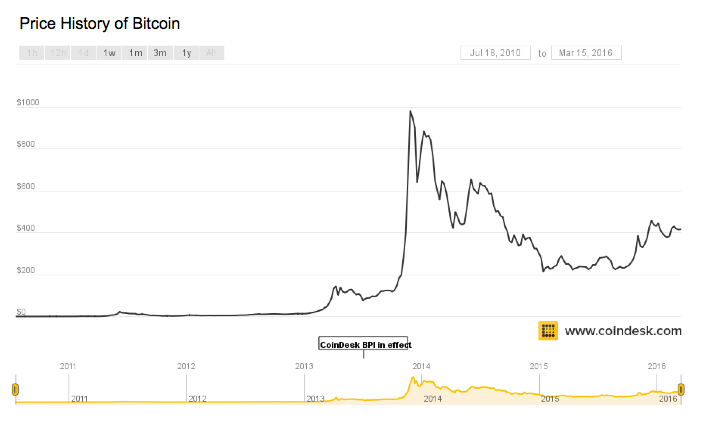 If you track the historical progress of bitcoin and gold prices, there was a period of about four years between 2008 and 2012, where values ran virtually in tandem, in an upward trajectory. Although the price movements associated with bitcoin were more erratic than the gold price fluctuations at times, they both managed to end up in a similar state of popularity with investors. What happened after that period of virtual cohabitation in the eyes of market watchers, was that gold fell out of favor and bitcoin values managed to virtually triple in value, while gold prices dropped 25% in the same timeframe. We all know the problem with statistics and you can often make them work for your argument if you pick the right way of looking at a situation, and choose a period where the figures work in favor of your opinion. It would definitely be wrong to assume that investors are now prepared to flee gold markets in favor of a new kid on the block such as bitcoin, which is what it is when you consider how long gold has played a part in our financial thinking. A major factor that heavily influenced gold and bitcoin rallies, was the monthly intervention of the Fed with their quantitative easing (QE) program. Although there is an argument to support why the Fed intervened in such a big way, their actions did have the effect of undermining the perceived value of national currencies and also hinted that inflation could easily get out of control, without QE. What happens with an action like QE, is that it doesn’t create the same response as more traditional monetary easing policies achieve. QE is not very effective in boosting aggregate demand or commodity prices, but can impact asset prices. 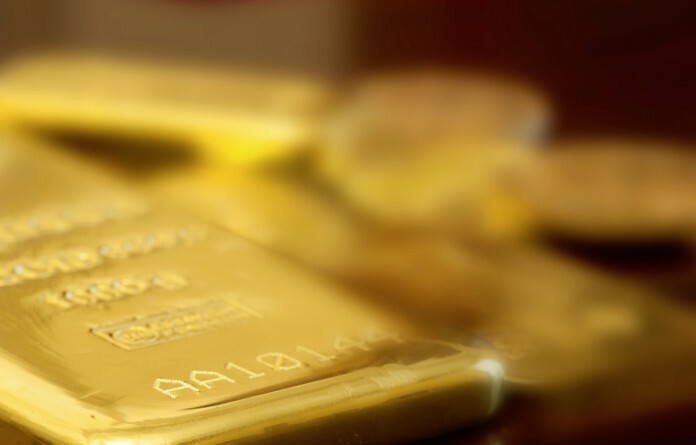 This form of intervention has proved to have a negative influence on gold prices. Are bitcoins similar to gold in this respect? Using this line of thinking and seeing what effect QE had on gold prices, you might reasonably think that bitcoins could be just as vulnerable to downward price pressures. Bitcoins and the concept of digital currencies in general, have certainly gained some credibility, and there are investors who are now prepared to view bitcoin as a viable alternative to gold, when looking for an instrument to shelter against a decline in the value of paper currencies. A rise in the popularity of bitcoins has helped fuel a growth in demand for the digital currency, which in turn, has helped to boost the price accordingly. In terms of deciding whether bitcoin is truly the new gold, it should be remembered that the bitcoin market is still thinly traded and largely unregulated in comparison to the established gold market. This means that sentiment and prices could just as easily swing away from the digital currency and the conclusion has to be that whilst it can be a useful instrument, it could be a risk conclusion to reach that bitcoin is about to replace gold as the default safe-haven in times of trouble. Political and economic uncertainty, tensions in the Middle East, interest rate rises. The list is fairly extensive when it comes to finding reasons for stock markets to display a fair amount of volatility, which is why investors who are seeking a way to balance their portfolio and cover all bases, tend to look to gold as a decent hedge. The start to 2016 provided ample evidence as to why gold stocks might be worth adding to your investment portfolio as a long term hold, so the question is, which gold stocks would make a good buy and hold? Here is a look six gold stocks to consider, although it has to be pointed out that this isn’t a recommendation to invest or specific advice. The aim is simply to highlight some stocks which might make a good buy and hold proposition. You will have to make your own decisions on whether to invest or not. Some oil companies have been struggling to get a handle on their operating costs as prices have fallen and the mining sector has seen similar issues for a number of companies. This is an issue that has been successfully addressed by the Newmont MIning Corp, who recently announced that their all-in sustaining costs were expected to improve from $900-$950 an ounce to $850-$950 an ounce in 2017. This is positive proof that the company has been successful in being able to reduce its operating costs and they expect that leaner fiscal management to progress over the next few years. This aspect alone is a fair reason to consider Newmont Mining as a long term play, because the peaks and troughs of mining results with some mining sites performing worse than expected, means that with costs under control, they can benefit from increased production at other more productive sites. Managing their production costs and output so well, will help the business to actually increase production levels overall and achieve sustainable production levels through to 2020 at least. Analysts seem to agree with the positive outlook, as the ‘buy’ recommendations outweigh the ‘sell’ suggestions by a comfortable majority. If you take a look at the recent stock performance of Goldcorp, you would quite rightly wonder why it would be on the radar of investors looking at gold stocks. As with most investments, it often pays to take a long term view and despite the fact that Goldcorp have dropped about 30% in value YTD and also managed to lose $192 million in the third quarter of 2015 alone, those figures need to be viewed in context, as it hasn’t been bad news all round. One particular nugget you can can glean from their latest earnings report, is that production rose by a healthy 40% in the third quarter, and this production boost was helped by new mines becoming operational, which would suggest that there is scope for those better production numbers to improve further over time. Goldcorp now has a lower need for capital that in the past and this has meant that the business has in the space of just 12 months, turned a negative cash flow of $355 million 12 months ago, into positive cash flow of $243 million, just 52 weeks later. You can take two differing views with regard to the stock performance of Harmony Gold Mining. The stock price is still dragging its heels and is 15% down from where it was about 12 months ago. However, the stock is actually up an impressive 161% since the end of 2015. The company recently reported positive earnings and is understood to be looking to grow through acquisitions and also benefit from debt repayments. The stock was valued at $15 back in 2011, so the current average trading range of about $2.50, shows you what happened to gold stocks when everything seemed to be going so well in the stock markets. Sentiment has definitely shifted in 2016 back towards gold stocks, with rises of 40% YTD being achieved across the sector, so as a long term hold, Harmony Gold may well have the scope to head some way back towards its 2011 stock value. A gold stock that has already taken off at the start of 2016 is Sibanye Gold, which has already risen by a healthy 85% so far this year. This stock is listed on the NYSE but the mining company operates in South Africa. It has estimated gold reserves of about 28 million ounces and uranium reserves estimated to be in the region of 102 million pounds. Analysts tend to agree that the stock price should add further to its gains already achieved and it has a market capitalisation of $2.6 billion. Yet another gold stock to recover in 2016 is Barrick Gold Corp, which has risen by just over 60% so far in 2016. The stock was changing hands recently at just over $11, but when you consider that the price was more in the region of $50 back in 2011, you can see that there is still scope to reach previously scaled heights again. This is not beyond the realms of possibility, when you consider that Barrick Gold is one of the largest gold stocks in the world and has the financial resources to be able to embark on a significant acquisition spree if it chose to. A similar story in terms of the stock performance, is unfolding at Gold Fields. The stock has managed to recover about half of its 2011 stock valuation, but it is still down about 25% compared to where it was about 12 months ago. The company’s all-in costs are current running at $942 per ounce and in its last quarterly update published in December 2015, it has achieved a $47 million cash inflow from operating activities. The CEO Nick Holland has promised ongoing cost saving initiatives and it is believed that a strong international portfolio will allow the company to further improve how the balance sheet looks in 2016. Taking a look at the price of gold now and comparing the price to the 2011 high of $1,980, you can soon see that gold stocks in general do offer plenty of potential upsides. There will be inevitable bumps in the road and sentiment can always change if economic conditions improve again, but at current prices, a rise in the price of gold as investors seek a safe haven, should translate to miners stocks as well. The six gold stocks highlighted could represent a good buy and hold opportunity, but only you can decide if that is likely to be the case or not. This post does not constitute a recommendation to buy and at the time of publishing the author has no holdings in the above companies. If you looked at what the price of gold has done over the the last three years, you could not be blamed for thinking that it would take a brave or foolish investor to consider putting any money into this precious metal. Some gold funds plunged by as much as 80% and the price of gold fell 35% over a three-year period, but if you had bought into gold at those dramatic tipping points, you would have prospered recently as market sentiment has shifted in light of recent turmoil in the financial markets. Gold has always been viewed as a decent hedge when stock market investors start to get nervous about a string of gloomy economic forecasts and unexpected events. The beginning of 2016 has been a chastening experience for many investors with trillions shaved off valuations, triggered by events in China and a general backdrop of political and economic uncertainty for the year ahead. Having set the scene for the coming year and painted a picture of fluctuating valuations and market volatility, it is also necessary to understand what is going on in the gold-mining industry and how it has reacted to falling demand and prices. The gold-mining has undergone a period of restructuring, which is not dissimilar to what has happened in the oil industry, which has also had to react to falling commodity prices and lower margins. Gold producers can only give themselves the best chance of gaining a competitive advantage over their market rivals, if they are able to demonstrate and deliver a high level of cost-efficiency and keep production costs to a minimum. These goals can only realistically be achieved through a period of restructuring and as has happened in the oil industry, many small players have seen their market share squeezed as a result of their cost inefficiencies and a lack of resources to be able to compete in a sustained low-price environment. This period of consolidation has resulted in a number of operators becoming leaner and giving themselves more opportunity to become profitable, especially if the price of gold moves upwards and they can benefit through lower operating costs and better margins. With the usual caveat that the following funds are just suggestions and not investment advice, based on a strategy for those considering how to invest in gold in 2016, here are some investment funds that you may wish to look at. 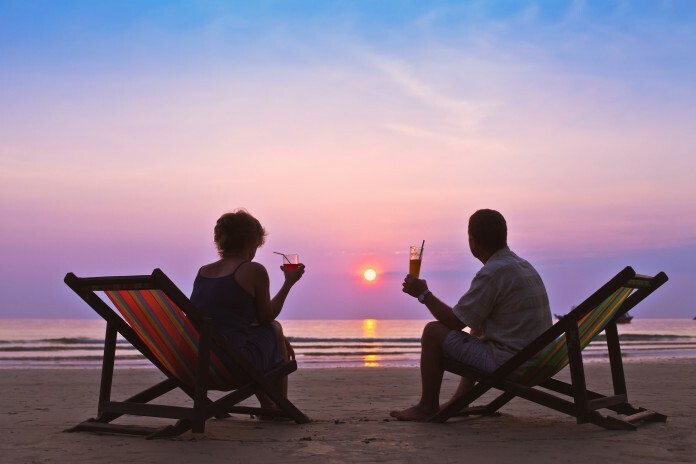 The average return in the last five years of -18.72% is hardly likely to have you salivating at the prospect of making a big return on your investment, but this fund has done better than plenty and if you believe that the tide has turned for gold, the fund offers a good spread of stocks and physical bullion. The fund includes a portfolio of gold-mining finance companies and operating firms who have a spread of long and short-term gold mines. A little over 20% of the fund’s assets are physical gold and silver bullion and it claims to be very cautious in its considerations of capital, operational and geopolitical risks associated with investing in gold directly and also gold-related securities. You will find all of these funds have been in negative-return territory for a the last five years and its annual return comes out at -24.11%, which is again better than many. One reason why you might want to consider this fund is that it adopts a no-nonsense research-driven approach that is concentrated on top-quality companies who can boast attractive production profiles combined with robust reserve bases and active exploration programs in place. Almost 80% of this fund is invested in equities of gold producers and the portfolio is heavily weighted towards companies from North America and Canada. This fund is therefore not as dependent on the price of physical gold, although it is of course relevant to demand and could be well placed if more investors and consumers help to push prices higher and help to increase productivity levels. If you are looking to generate an income from your investment, this fund seeks to achieve this by investing in companies actively engaged in mining,fabrication, processing, and distribution of gold. The fund has achieved an average annual return of -23.99% and the portfolio is weighted towards gold producers based in Canada, who account for about 66% of the total allocation and U.S gold producers currently account for 12% of the funds assets. One point to consider about this particular fund is that its top five holdings represent close to 40% of its total holdings, which could result in greater price volatility for the fund if these stocks perform poorly, unless of course they have chosen the right ones to prosper from a recovery in gold in 2016 and beyond. Gold mutual funds are an alternative option for investors who are reluctant to put their money directly into physical gold and represent a slightly more conservative approach than some other ways of investing in gold such as gold exchange-traded funds or junior gold stocks, which is definitely a boom or bust option, and can result in potential triple-digit gains or losses if exploration plays don’t reap positive rewards. 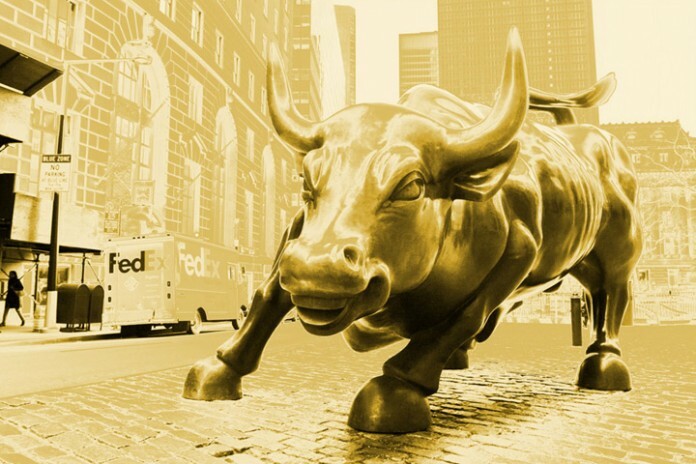 Gold itself is still not a speculative asset in general terms despite the volatility in prices during recent times, but as part of your portfolio, you may well benefit from a patient and strategic involvement through a suitable fund, which may well display the green shoots of recovery if the markets continue to react adversely to economic and political events. There are two distinct types of coin investment. Those that are worth equivalent to the precious metal they are made from and there are plenty of gold and silver coins in circulation. Then there are the collectable coins which have a rarity value and are sought-after by those of us who are not only interested in the history behind each coin and its rarity value. If you asked the majority of coin collectors what their ultimate prize coin would be, many of them would name the 1804 Silver Dollar. This coin qualifies as the most precious US coin of all time and if you are fortunate enough to own one of only 19 copies that are known to exist, that one dollar is probably worth an inflation-busting $10 million. Here is a look at the coins that can be classed as in the top ten of the most precious and sought-after coins you can lay your hands on, if you have the financial resources to do so and can find a seller willing to part with it. 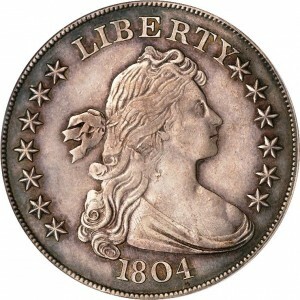 The star of the show and probably the most prized collectible coin anywhere, is the 1804 Silver Dollar Draped Bust. If you find a specimen that is in good condition it could worth anything up to $10 million, but as only 19 copies are known to exist, the chances of coming across this very rare coin are very slim indeed. There are numerous envious numismatists who admire its rarity, beauty and design features but know that they will never be able to add this coin to their collection. 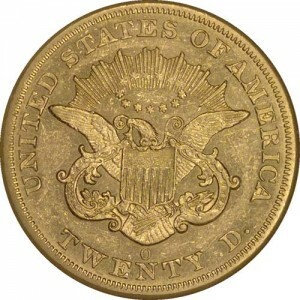 Although the Double Eagle is usurped in value by the 1804 Silver Dollar, many collectors consider this coin to be the most fascinating and famous coin around. It is a fascinating story that has resulted in this becoming one the rarest coins in the world. 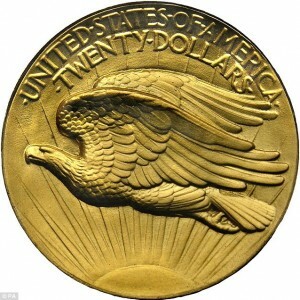 A healthy 445,500 specimens of the Saint-Gaudens Double Eagle were minted back in 1933 but none of them were ever officially circulated and they were all subsequently melted down, with apparently just two of the coins spared. It later turned out that about 20 of the coins were stolen before they were sent for melting, but the Secret Service tracked 19 of the coins down. What is now known is that one of the coins is owned by a private collector who paid $7.9 million for it back in 2002 and ten other copies of the coin are safely stored away in Fort Knox. 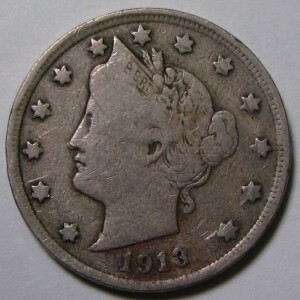 Third place in the list goes to the 1913 Liberty Nickel, which has an estimated value of $5.9 million. The reason why a nickel coin could be so valuable is that the coin is a real rarity, because it was produced without the knowledge of the U.S Mint. There are plenty of theories and stories as to how this bizarre situation came about, but the reason it is worth so much is not just down to the mystery surrounding the coin but also due to the fact that there are only five examples of this coin in existence. Acquiring this coin for your collection will set you back in the region of $5.1 million, but again the chances of buying one are very slim indeed. Less than ten of the coins were ever produced and only four are known to be in existence. As well as the rarity aspect there is also an interesting story behind the coin, as the coin was actually minted in 1834 and intended for diplomatic presentations,some thirty years after the date on the coin. The story behind this coin is that the U.S Mint ceased production of the coin at the last minute, due to some design-revisions. A few of the coins had already been minted by the time the instructions to stop came through, meaning that there are only two known to exist, with a value of about $4.5 million each. This coin is an iconic image and you can even buy a book which is dedicated to the story of this particular coin. 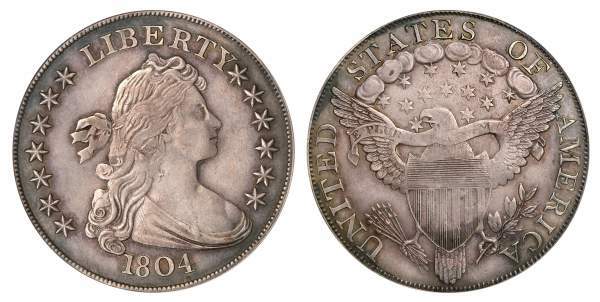 There are 125 documented examples of the 1794 Silver Dollar and its rarity combined with the fascination of the history associated with this elusive piece of metal, means that you are likely to have to find about $3.2 million to put one in your collection. Back in 1795, President George Washington took positive action to address the copper shortage being experienced by the country, and he did this by instructing that the weight of certain coins should be reduced. 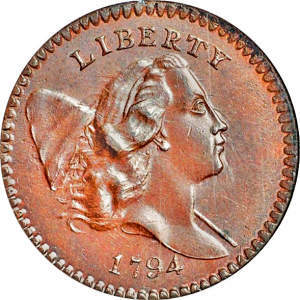 One of the rare coins that now exist as a result of this policy is the 1797 Half Cent, which fascinates numismatists everywhere and commands a value of about $3 million when one comes up for auction. If you love tales of the Wild West, this coin will definitely appeal. 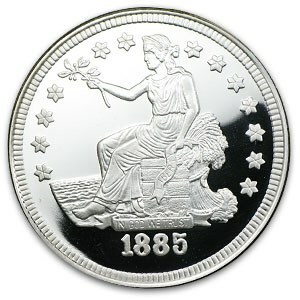 The 1873 Dime is considered to be the only unique issue produced by the Carson City Mint. It filled its coins using gold that was plundered from nearby mines and the value of one of these remaining examples if estimated to be about $2.7 million. 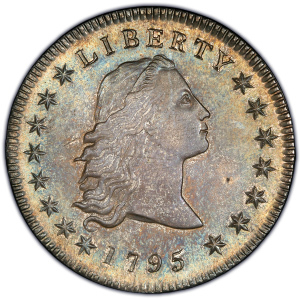 There is only one known example of this coin and that changed hands back in 1982 for $687,500. Rumors persist that there is another example of the coin buried somewhere under a San Francisco building, but that is where it is likely to remain if the story is true. 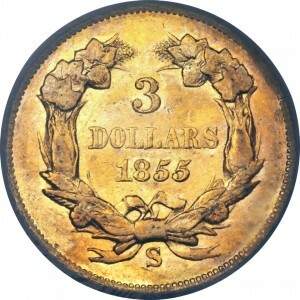 This means that the only confirmed example of an 1855 Three Dollar Gold Piece is now said to be worth in the region of $2.7 million. This trade dollar was designed by William Barber and there are only five proofs of this coin for 1885 in existence. The last auction of an authenticated 1885 Silver Dollar Trade coin was back in 2006 and it fetched $3.3 million. The estimated current value of a genuine version of this coin is around $2.6 million, although a mint condition one would more likely fetch close to $3.5 million. Coins as an alternative investment is a growing in popularity but the conundrum is always trying to find the balance between investing and collecting, as the two don’t always meet in the middle. A lot of investors start of with gold and silver bullion and progress into coins. Rare coins are a mature and established market and if you are looking at investing in this area, you should be aware that rare coins are mainly defined by the fact that there a fewer coins available than the demand for them and also if they are at least pre 1930’s. 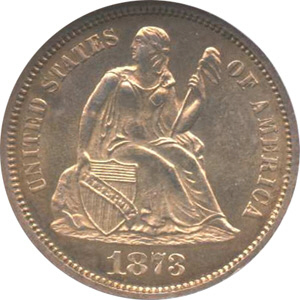 Rare certified U.S coins and in particular gold coins, are different to bullion. 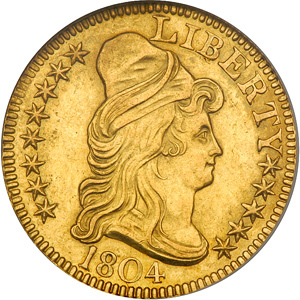 So while a current one-ounce gold American Eagle is not rare by any means, one that was minted back in the 1800’s might be a different story altogether. Certified ancient coins are the next investment category. This is a growth area in coin collecting and this is mainly due to the fact that the Numismatic Guaranty NGC Grading System has created an opportunity that was not there before. The other specific category is referred to as key date U.S coins. This is the term used to describe the rarest coins from a known series and this is the area where serious investors tend to be found. It is always advisable to try and find a knowledgeable numismatist for guidance if you are looking at adding some coins to your alternative investment portfolio.